‘Moloch’ is the fourth and most epic album by the German ritual ambient project Vortex. Combining droning ambience, pounding percussive outbreaks and noisier elements they’ve crafted an apocalyptic soundtrack for urban decay. ‘Moloch’ means ‘king’ and is originally the name of an Ammonite god who was worshipped by the Phoenicians, the Canaanites and some North African cultures by sacrificing their own children to him. 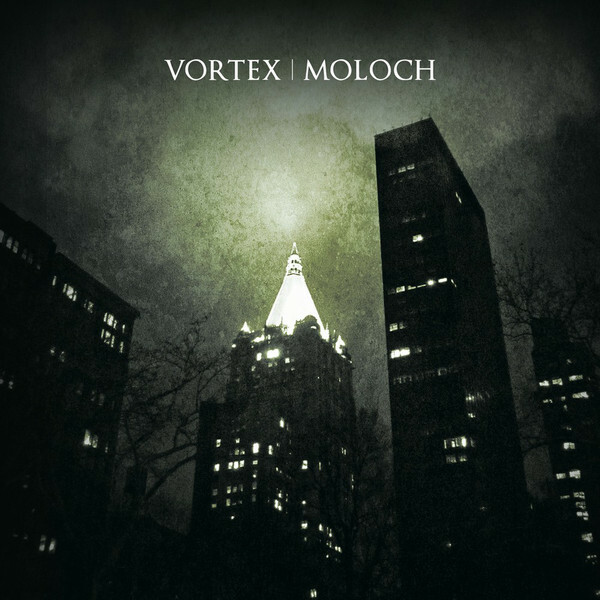 In later ages ‘Moloch’ has become a metaphor for an entity demanding a very costly sacrifice…Marcus Stiglegger says about the album’s inspiration; “In 2013 I visited New York City to see what was left of the unique mood i came to appreciate from the inspiring, New York based american cinema of the late 1970s. While visiting the shooting locations of films like Cruising, Taxi Driver, Wolfen, French Connection, Mean Streets, Maniac, and many more, I had a lot of strange encounters in the city streets. I continually felt absorbed by this Moloch of a metropolis which made me one of its demons – a hunter with a camera lens. This album and its artwork is the result of this intense and sometimes frightening episode in my life.’ For the recording of this dark and impressively cinematic album, Stiglegger joined musical forces with Bergemann (Mink M. Ra), MARS & The Trail, Christoph Wirth and Patrick Kilian of Dvrtal and Rome Asleep. Besides field recordings the music was composed based on acoustic instruments like guitar, strings, flutes, jaw harp, various percussions and voices, joined by elaborate keyboard compositions. Edition of 500 Copies in 4 panel Hardbound Digibook with 32 pages booklet.